Gd5(SixGe1-x)4 compounds undergo first-order phase transitions close to room temperature when x ~ = 0.5, which are accompanied by extreme changes of properties. We report the fabrication of the nanoparticles of one of the parent compounds-Gd5Si4-using high-energy ball milling. Crystal structure, microstructure, and magnetic properties have been investigated. Particles agglomerate at long milling times, and the particles that are milled >20 min lose crystallinity and no longer undergo magnetic phase transition close to 340 K, which is present in a bulk material. The samples milled for >20 min exhibit a slightly increased coercivity. Magnetization at a high temperature of 275 K decreases with the increase in the milling time. 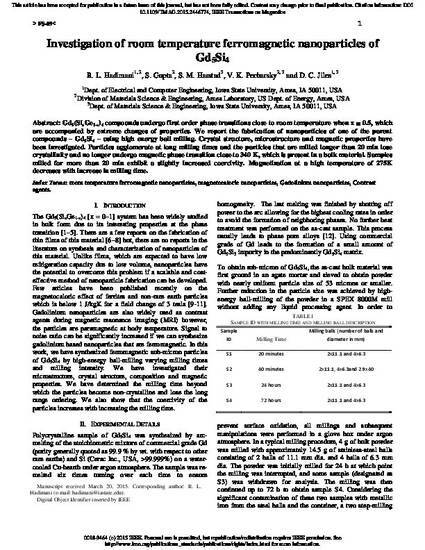 This is a manuscript of an article published as Hadimani, R. L., S. Gupta, S. M. Harstad, V. K. Pecharsky, and D. C. Jiles. "Investigation of Room Temperature Ferromagnetic Nanoparticles of Gd 5 Si 4." IEEE Transactions on Magnetics 51, no. 11 (2015): 1-4. DOI: 10.1109/TMAG.2015.2446774. Posted with permission.